On November 28th, while our Faast team was developing an intrusion module for PhpMyAdmin MySQL manager, we detected a new cross site scripting vulnerability not known so far in this popular program. It has been privately reported to the team responsible for PhpMyAdmin security and the CVE-2014-9219 has been assigned. It affected all known versions. PhpMyAdmin security team has reacted promptly and in just three days they have fixed the problem and released a new version. The vulnerability (currently exploitable in any version previous to 4.2.13.1) relies in a bad filtering in the "url.php" file. The function htmlspecialchars was being incorrectly used. 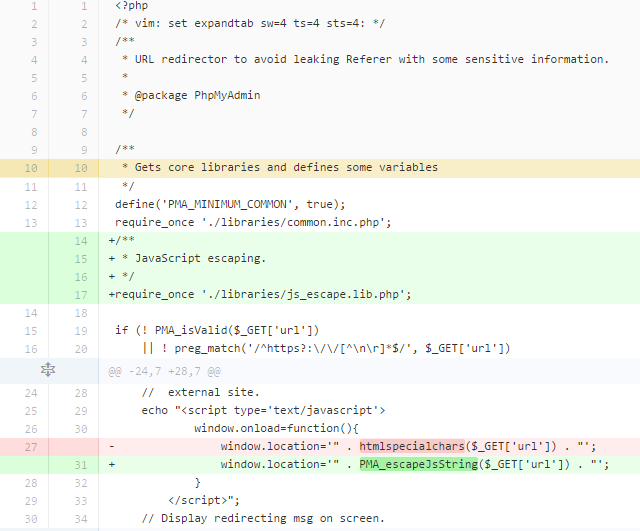 The figure below shows the applied patch where htmlspecialchars function is replaced by PMA_escapeJsString. Just filtering HTML special characters, its exploitation was trivial. Besides, it was possible to bypass anti-XSS protections in browsers, because the injected code was reflexed into a "script" tag. This kind of vulnerabilities are very common in web applications, and allow different attacks, as obtaining session cookies, as shown in the figure below. If you are using PhpMyAdmin, it is recommended to update as soon as possible to latest version (4.2.13.1) or applying the patch available here. Besides, we recommend using Faast that, of course, already detects this vulnerability. Finally, remember we have a Latch plugin for PhpMyAdmin. All the information about how to install it, is here.